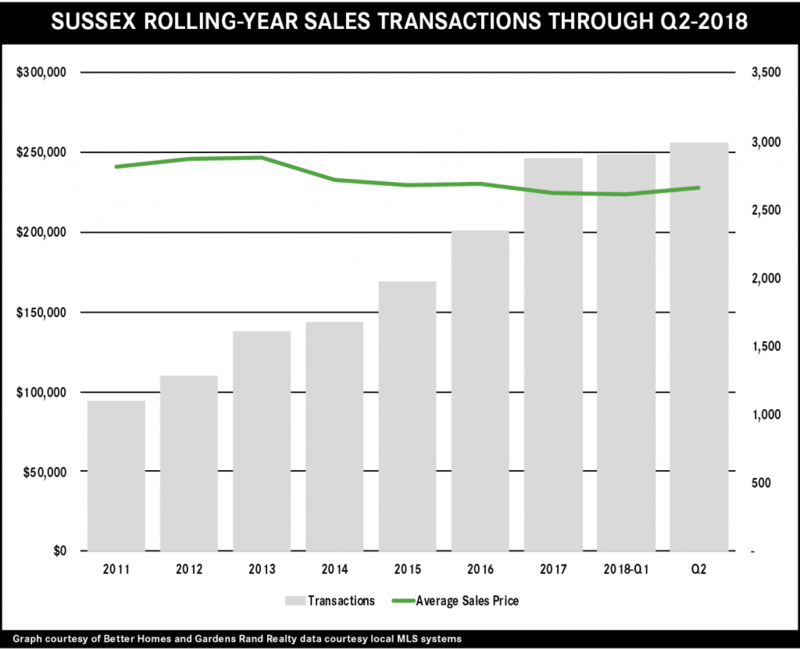 The Sussex market surged again in the second quarter, with sharp increases in both sales and prices. Transactions were up over 11% from last year’s second quarter, continuing a yearlong trend that brought sales up almost 14% for the rolling year. That kind of buyer demand has winnowed down the housing supply, with the months of inventory falling over 21% from last year and now getting close to the six‑month mark that signals a seller’s market. We’re certainly moving into that territory, given the spike in pricing in the quarter: rising almost 7% on average and 8% at the median. Prices are still relatively flat for the year, but the lack of inventory and high demand will likely drive both sales and prices in a strong summer and fall market.